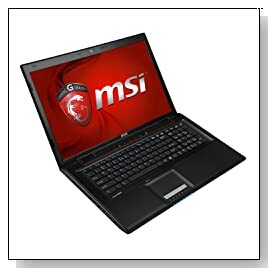 Black MSI GP Series GP70 Leopard-490 (9S7-175A12-490) is a modern low cost 17.3 inch large Full HD screen gaming laptop with a 4th generation Intel i5 processor, ample storage and generous memory and NVIDIA GT940M dedicated graphics card and you can be sure you will get some level of gaming performance from it with modern games- this is a great budget gaming machine with decent specs and multimedia capabilities and now let’s see why. MSI GP70 Leopard comes with the mid-2014 release dual core Intel i5-4210H processor at 2.9 - 3.5 GHz speed with turbo boost and hyper threading for great four-way processing power, 8 GB DDR3L SDRAM to multitask very smoothly of whatever app or program you use it for, 1 TB Serial ATA hard drive at 7200 rpm rotating speed as large storage and the ability to open files faster than the regular 5400rpm and Windows 8.1 64-bit operating system- the latest Win 10 should be released soon (you will have free upgrade within a year of its release). Matte 17.3 inch diagonal non-touch display with 1920 x 1080 pixel max screen resolution offers crisp image with accurate colours. NVIDIA Geforce GT940M with 2GB VRAM is more like a low to mid-range card and very demanding games like Assassin's Creed Unity can be played at lower settings and resolutions but a lot of the latest games at medium settings and normal HD resolution at 50 frames per second or so and if you move it up to FHD then frame rates will decrease too. You will have no problems playing the standard easy games like World of Warcraft at settings and resolutions at maximum. There is also the integrated Intel HD 4600 that matches GT620M and GT630M in performance and a bit less than the dedicated GPU on this machine. 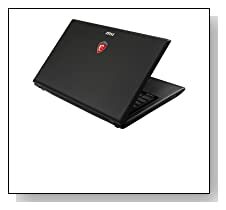 Black MSI GP70 measures 16.45 x 10.60 x 1.53 inches and weighs 5.95 pounds and it is not really bulky or heavy as compared to other 17 inch laptops but it still should be considered as a desktop replacement PC rather than a portable one. It is offered with a 6-cell lithium ion battery that lasts for two to three hours during gaming and longer for lighter stuff like surfing the net and you’ll probably often need to be near a power outlet, it works quietly and cools efficiently- stays cool even during heavy gaming. It has a very long power charging cable and connectivity options include DVD SuperMulti Optical Drive, Intel 3160 802.11ac wireless, Bluetooth 4.0 to connect to Bluetooth enabled peripherals wirelessly, Gigabit Ethernet with RJ-45, 2 x USB 3.0 ports, 2 x USB 2.0 ports, HDMI and VGA ports for connecting to a HDTV or an external monitor- new or old, SD Card slot and a 720p webcam to chat with gaming mates. Conclusion: MSI GP70 Leopard-490 ; 9S7-175A12-490 comes with the Haswell Intel i5-4210H with a Passmark benchmark score of 4683 as of today which indicates it is a high end CPU that is fast and powerful for both daily and more demanding tasks such as decent gaming performance with the Ge Force GT940M graphics card. 8GB memory is plenty for most people for multitasking of apps, programs and browsers without delays or freezing and you may upgrade it up to 16GB on its two memory slots. 7200rpm speed 1024GB HDD hard drive is faster than the older 5400rpm hard drives but nowhere as snappy as SSD’s but you are also getting quite a lot of storage space for all your multimedia files and you may choose to put an SSD easily on the mSATA slot provided down the track. Touchscreen would be nice for Windows 8 apps but is not really necessary for gamers and this is designed to be a budget gaming laptop. Full keyboard is not backlit but is comfy to type on with nicely spaced out keys and a 10-key numeric pad on the side. You are a little restricted with the most demanding games as you can only play them at lower settings but for any other apps or software you will have no problems. So if you want a powerful and relatively portable machine with high end specs including a large FHD display and faster internet and some level of gaming but you are on a budget then this would definitely be a good choice.